This past week I was at a conference in Las Vegas. Normally, I am not a huge fan of Vegas, that being said it does offer some unique experiences you cannot find elsewhere. At the conference, my coworker was raving about this "hyper-reality" (a.k.a. virtual reality or VR) experience from The Void and said I had to try it. There are two experiences available in Las Vegas: Star Wars: Secrets of the Empire and Ghostbusters. Other locations include Anaheim, Dubai, Edmonton, Lindon, London, New York, Orlando, and Toronto. I have plenty of VR experience, and currently own both an Oculus Rift and a Playstation VR. Given my expertise, I was little skeptical at how much better a "hyper-reality" experience could be. That being said, I did some research online and it looked pretty cool. For $35, I said to myself, #YOLO how bad could it be? The lure for me was tether-free VR exploration. I was not about to build my own VR backpack, and I do not have the luxury of dedicating entire room(s) for VR. With that, a few of us headed to The VOID at the Venetian. The staff was very friendly and welcoming for the most part. They were adamant about the no photography policy inside the area for "trade secrets" reasons. All of us were pretty disappointed about this. I still took a couple of photos to share with you folks. Checking in and signing the waiver was painless. 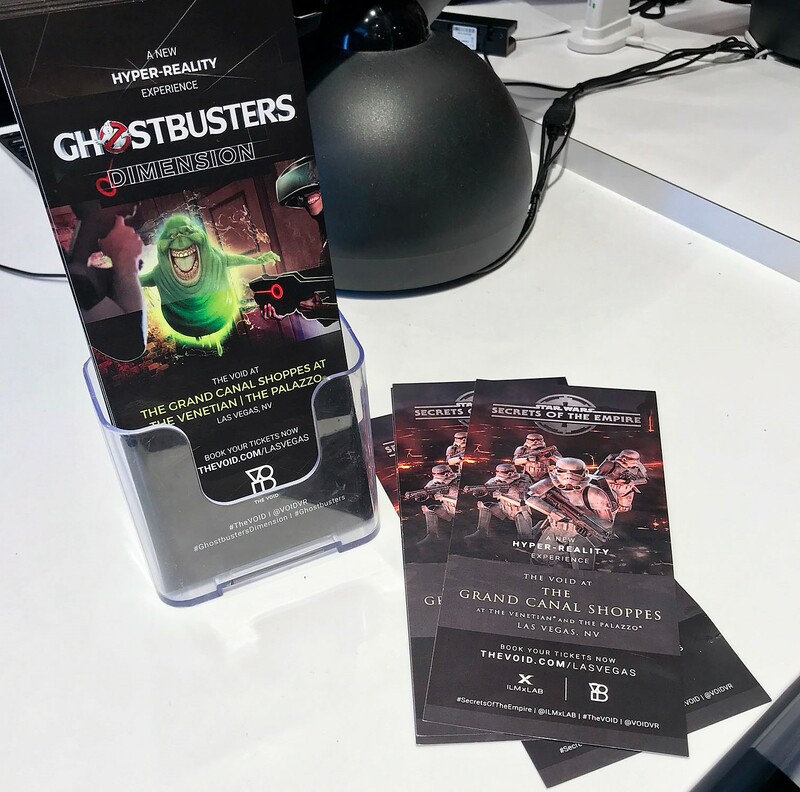 For the Ghostbusters experience they give you a player card with a QR code on it representing your avatar in VR. 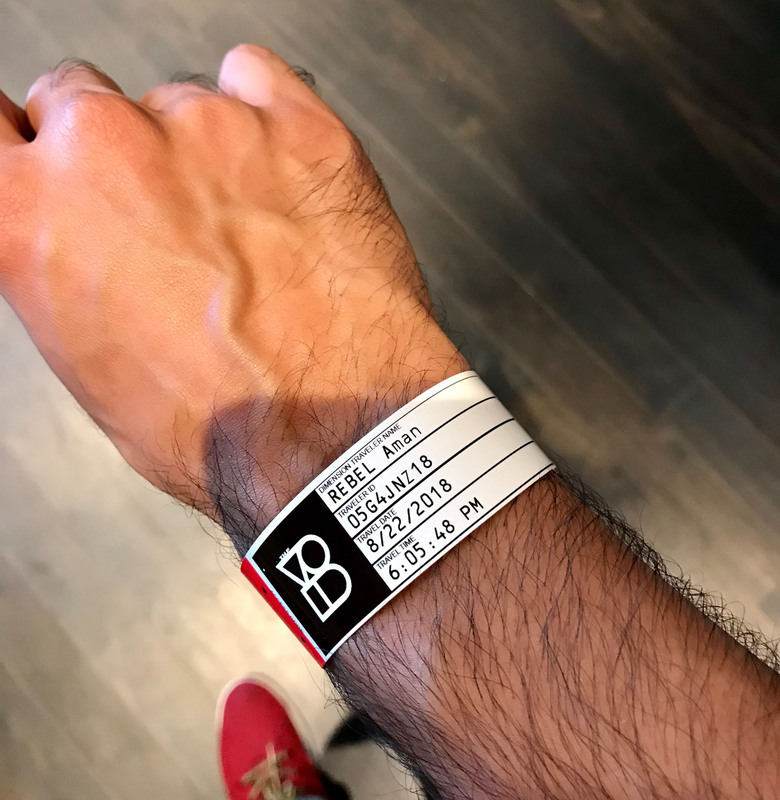 For the Star Wars experience they give you a wristband with a QR code on it. All of the avatars are more or less the same in the Star Wars experience. They were pretty organized about setting up and maintaining the VR backpacks. I am guessing the backpacks weigh between 15 and 20 pounds. That includes a PC and a battery. The backpacks are also equipped with some force feedback mechanisms to simulate being hit with gunfire. 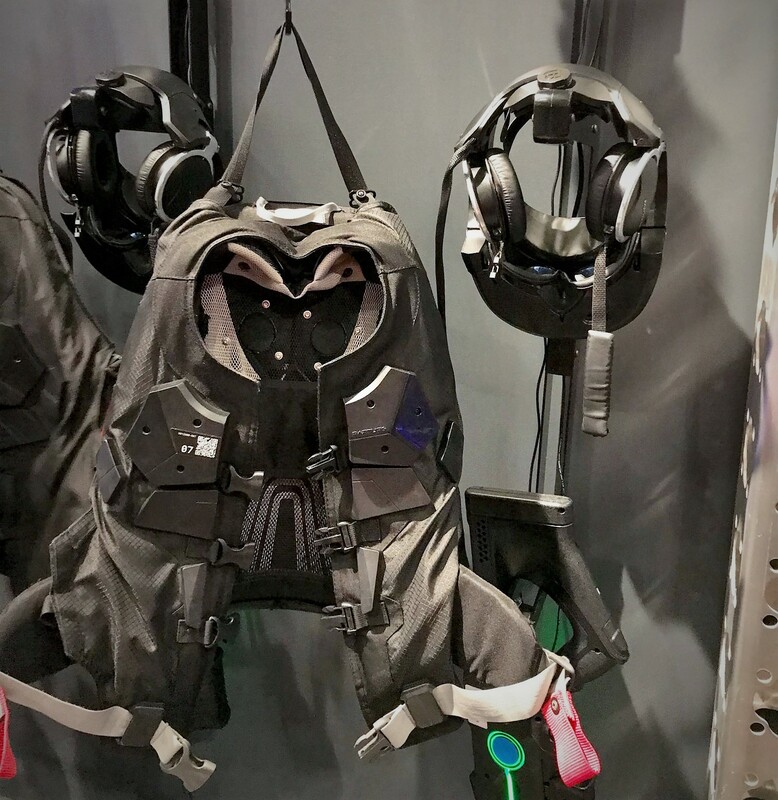 The VR unit had over ear headphones and mics built in. Also, it was pretty clear that the VR unit had a wide angle camera on the outside for body and room tracking. First we went through the Ghostbusters experience. Before you get set up with your gear, you watch a two minute introductory video to set up the backstory of your environment. You are a Ghostbuster trainee and your first mission is to go to an old apartment building and take out an ancient ghost. Honestly, I think we all know these backstories are arbitrary, and are really just a loosely threaded way to have you shoot stuff. You end up walking into an elevator and are going up to the top. The floor actually vibrates to simulate the elevator movement. It felt very lifelike. There is also a balcony area where you are outside of the apartment building where they have fans to simulate wind. That felt pretty real as well. There are only really three rooms where you actually get to shoot stuff. The rest is more exploration and being immersed in the environment. Our second round was the Star Wars experience. We had to go through another two minute prep video. The basis of the backstory is: you are traveling to this lava-like planet as a rebel disguised as a storm trooper. Your mission is to track a crate that contains intelligence for the rebellion's survival. Short and sweet. Now let's shoot stuff. In Ghostbusters you go in with blaster rifles, this time around going in without any weapons was felt awkward. Soon enough, as we were exploring the planet, we came to a room with weapons and got to pick them up. When you arrive at the lava like planet, you immediately feel heat and smell barbecue. This adds to the "fourth dimension" feeling. The "solving puzzles" they refer to on their website is actually just VR Simon Says. It was also not immediately apparent we needed to play Simon Says as we were being fired upon at the same time. I think it was a divide and conquer scenario where you have two people fight off the baddies, and the other two work on the puzzle. Oops. The VR setup itself was great. The built-in headsets were essential so I could communicate with the rest of the team. I felt force feedback in specific areas when I got shot or objects were thrown and hit me. The blaster rifles also had force feedback for when you were shooting. For the most part movement and interaction were fluid and accurate. Being able to move around freely between areas in what felt like a real world is a game changer for VR. The Star Wars experience was clearly much more polished than Ghostbusters. It also felt like it was longer - though I did not time both experiences precisely. The movement of the storm troopers felt extremely natural. One of my co-workers who is 6' 4" was clearly much taller in the virtual world and I could immediately tell it was him, even though we all looked the same. I thought this was a really nice touch. By comparison, at times the avatar movement in Ghostbusters felt glitchy. If you happen to be in one of the cities where The Void is located and are interested in checking out a cool VR experience, I recommend you give it a go. My personal preference was for the Star Wars experience. Though $35 is a bit steep for 10-15 minutes worth of entertainment. That being said it is truly unique when compared to home VR systems. It is something that you would need a multi-room set up to replicate, as well as fairly expensive and proprietary equipment. I have also experienced headaches and dizziness after being in VR previously. I did not have any of those symptoms after this experience. Overall, it was fun. It felt more like a tech demo and lacked the same level of polish as the Star Wars experience. I felt it was shorter and got less bang for my buck. This experience will absolutely stick with me. I felt like we were actually disguised storm troopers in the Star Wars universe.